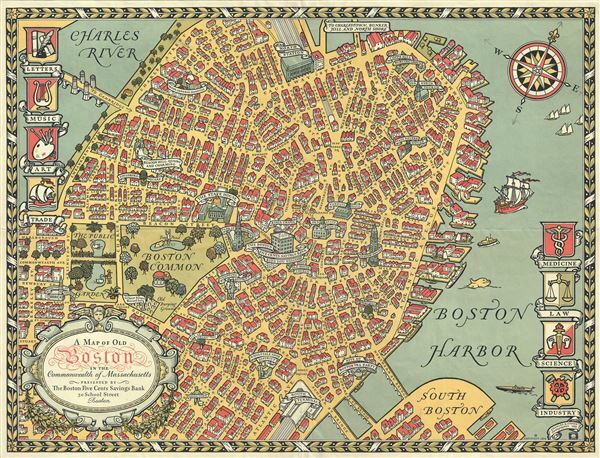 This is a quaint and charming pictorial map of the tourist sites of downtown Boston in 1929. This map was drawn by Charles R. Capon for the Boston Five Cents Savings Bank – which is located at the center of the map. The map depicts important buildings and historic sites in profile with banner style name tags. To either side of the map there are various medallions promoting the arts and sciences. A Baroque style title cartouche appears in the lower left quadrant. Presented by Boston Five Cents Savings Bank, 30 School Street, Boston and printed by the Sherrill Press, Boston. Very good. Minor wear along original fold lines. Map folds into original presentation folder. Folder shows some wear.